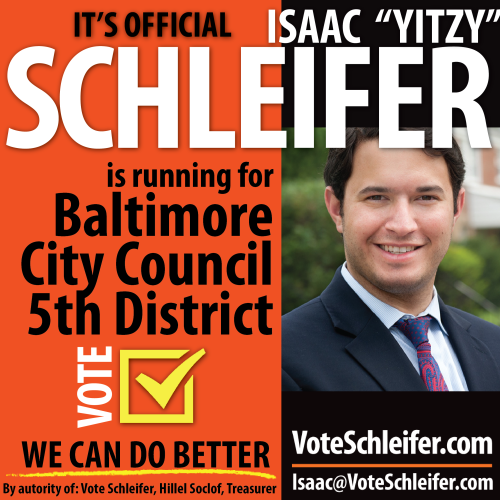 Democratic Central Committee member Isaac “Yitzy” Schleifer announced today the launching of his campaign for council in Baltimore City’s fifth district. His announcement came several weeks after Schleifer launched an exploratory committee, following months of persistent efforts to enlist his candidacy by business and community leaders in the district. “With their encouragement, I decided to enter the race after careful consideration of the district’s needs, talking to hundreds of residents who are unhappy with the current leadership, and hearing again and again that people are concerned about high property taxes, high crime, and other major issues in our neighborhoods,” said Schleifer. A life-long resident of the district, Schleifer is a small business owner who is the Vice President of the northwest Baltimore City’s Cheswolde Neighborhood Association and who sits on the Board of Directors of Myerberg Senior Center, Hebrew Free Loan, Suburban Orthodox, is on the advisory council with the BSSP community safety organization, and was recently appointed to serve as a community liaison to the State’s Attorney’s Office. He is also involved with the American Red Cross and numerous other organizations.